Yesterday I wore one of my favourite skirts of all time. I have had this for at least 4 years and it's from Reiss. Reiss is one of those brands I really like - but rarely buy from. I always find the fit of their clothes a bit odd (sometimes vanity sized and sometimes tight in weird places - might just be my body of course!) and the prices too high. At sale time though I am all over it - and I remember buying this skirt for less than a third of the original price. I loved the colour - a blue that manages to be bright and soft at the same time - and the delicate frills that cover it. This was in the bargain bin section of BABW - which is generally the land of yucky, seasonal scents that have not sold well. I suppose not everyone would like this but to me its so fresh and light and perfect for hot, summer days. Cue me spraying it every 5 minutes. I think I need to get my hands on the Sensual Amber body splash....in fact I want everything Sensual Amber :) That and Twilight Woods (especially the men''s version) are my favourite BABW scents. a) This is what I made for breakfast yesterday - completely pointless to include but just looking (and eating) it makes me happy. Gelish is what they do in the salon nearest me and I do like it - I have had it many times...but after a while it's as bad for your nails as anything artificial....but the trouble is it looks sooooo good. The thing with Gelish is that as easy it is for going on vacation or that kind of stuff, I get quickly tired of wearing the same color for 2 weeks in a row! I would say regular manicure, but as I am currently (all the time) obsessed with acrylics... I would say go get the gel! what a beautiful skirt! I havnt got anything that colour and I love the style of it! I love that skirt!! I got it in black a few years back too, but there was no way I could of afforded it if it wasn't in the sale. I ADORE Reiss' accessories but agree that the sizing is slightly off. that skirt is so very feminine and pretty, I love it. Sensual Amber is THE most amazing scent ever I have the candle and love burning it all the time. That photo of the pancakes is so amazing and now I'm severely craving them lol. that skirt is amazing, i have never seen anything like it! LOVE. i love twilight woods, now i have to find sensual amber to see if its good-thats gonna be fun! I really love the ruffles in that skirt! I can't comment on the nails as I've never tried gel nails. If I'm thinking of the same process, you have to pick from their special polish. I own quite a few (okay, a lot of) polishes and like bringing my own when I get a manicure so I don't think I'd like gel for that reason. My friend gets gel nails and her nails do look pretty though. I've always wanted to try Reiss (their dresses look so lovely on Kate Middleton). Also, your breakfast looks devine! Laura, I think we may be on the same BABW scent wave length. 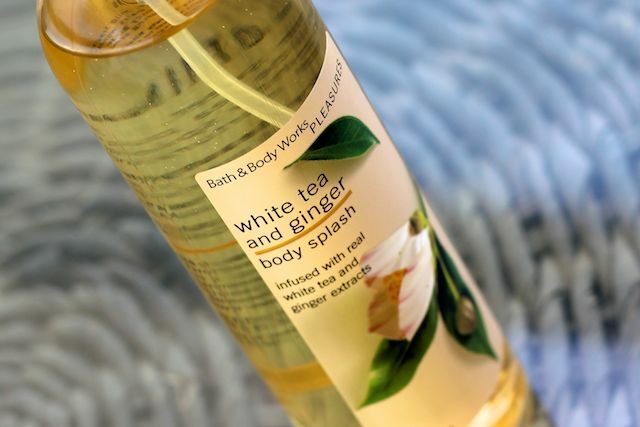 Completely love and white tea and ginger-they discontinued it stateside :( sensual amber (but who doesn't? ), and twilight woods. So I highly, highly reccommend their new scent Acorn and Fig, I picked up the candles and it is to die for. It's such a smooth woodsy/sandalwood scent that doesn't overwhelm your senses! Check it out, if you can! By far the best outfit you have ever posted! That skirt is simply stunning. You ALWAYS look so perfectly put together. I envy that. The skirt is lovely, a good piece to edge an outfit! Argh that breakfast look delish, i love the feeling of making a satisfiying breakfast, it just makes my day haha! Jealous in every way! Pancakes look gorgeous too! My little sister and I are both addicted to Gelish at the moment. The finish is immaculate. 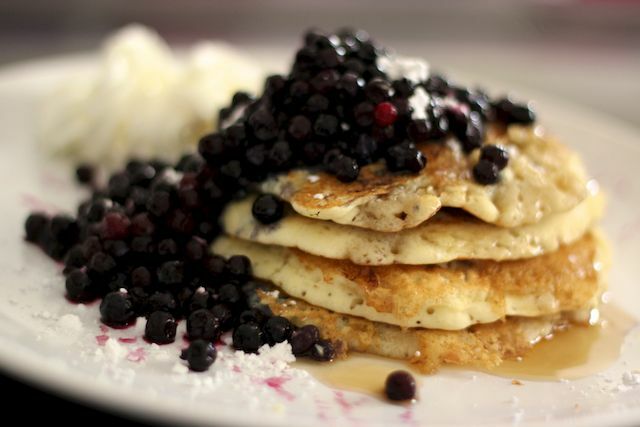 I so do love your skirt and the look of the blueberries piled atop the pancakes. As for the manicure, my advice is to do the regular manicure. It's such a pain to grow healthy nails again. I love the skirt! Gorgeous colour and I love the frilly bits! So gorge with the white tee. I feel slightly stalkerish saying this, but I remember that skirt from your old blog. i love your focco. it looks surprisingly real. i really want one but i cant dish out on it, thinking, well no, knowing that il grow out of loving it. so maybe a focco is the right way to go! i have the same problem with Reiss, you worded it perfectly. I also think their clothes can look a bit dull and dated, and must be combined the way you did- with different, casual things. I LOVE that skirt and i'm kicking myself for not seeing it. I remember wanting that skirt when it was in Reiss but debating over it for so long that it ended up sold out before I had finally deciding that I was just going to go for it - so sad! This post makes me want it all over again!! the pancakes look gorgeous! And I love the skirt, I have not even considered wearing a skirt since my preteen years....must reconsider now! love your style, absolutely chic and very cute. Thanks to you I came across this brand REISS and I love it. Love this post, was wondering what happened to you???!!! That skirt is amaaaazing!!! Looks great on you as always...I just received my grey focco!!! I LOVE it!!! It gives off the greatest vibe when carrying it!!! Thanks for that post too!!! uuuuuhhhhhh I LOVE THAT SKIRT. Gosh. gorgeous skirt..love the color, details and silhouette...its perfect! Love the skirt--and possibly the pancakes more. Pastries of any kind are a weakness I refuse to deny myself! That shade of blue looks great on you, and as always, effortlessly put together! Laura, I loved the quality/effect of those outfits pics! So soft and warm..and that SKIRT! Beautiful post and that little skirt is just adorable. just got the grey focco. love it! I am simply loving your skirt...so fun and flirty and the color is beautiful! I don't know how I only now am discovering your lovely blog, but I suppose it is better late than never! :) Love it...oh and your breakfast looks delish! I've just noticed that you've been shortlisted for best NEW FASHION BLOG in the COSMOPOLITAN BLOG AWARDS! You should announce that you've been shortlisted on your blog - it's such an AMAZING achievement and I'm sure we'd all love to vote for you. love the style and the colour of this skirt... so cute.